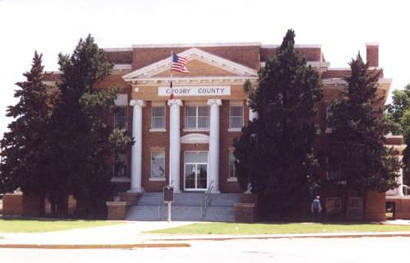 Crosby County Courthouse, Crosbyton, Texas. 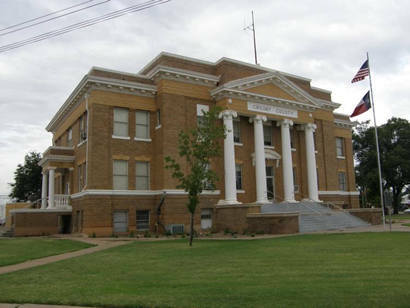 Crosby County, created in 1876 and organized 1886, had its first county seat at Estacado (founded 1879 by a colony of Quakers). It was on a mail and stage road, in the northeast corner of the county. Freight hauling of materials was slow. 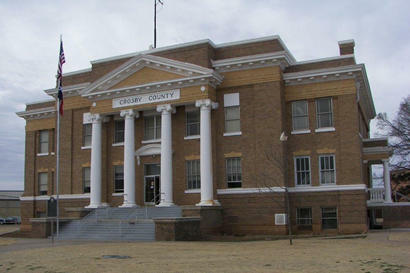 County offices were in dugouts, shacks and wagons for two years, until the first courthouse could be completed in 1888. The second county seat was established in 1890 at Emma (named for the fiancee of R. L. Stringfellow, one of the town's promoters), nine miles west of here. 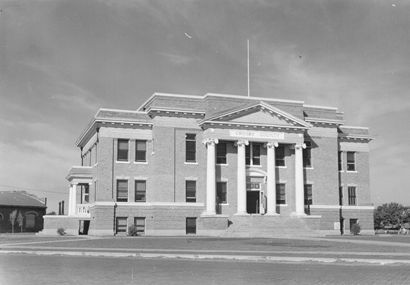 The courthouse at Estacado was taken down, moved and rebuilt at cost of $3,000. It served 20 years. When the Crosbyton-South Plains Railroad was built in 1910, Emma was four miles off its route. 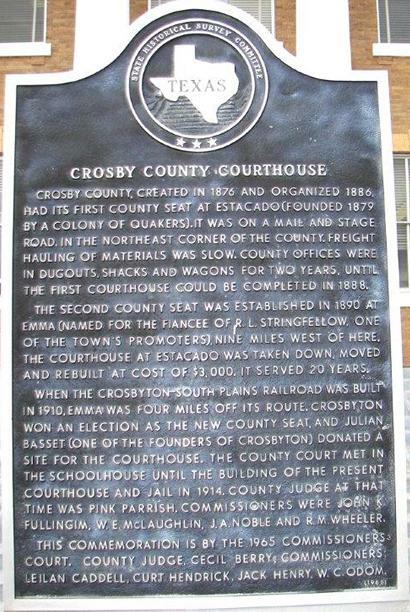 Crosbyton won an election as the new county seat, and Julian Bassett (one of the founders of Crosbyton) donated a site for the courthouse. 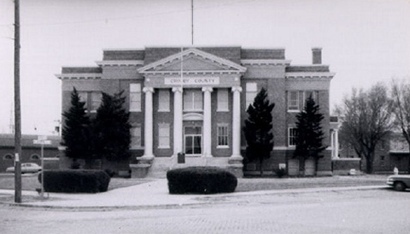 The county court met in the schoolhouse until the building of the present courthouse and jail in 1914. County judge at that time was Pink Parrish. Commissioners were John K. Fullingim, W. E. McLaughlin, J. A. Noble and R. M. Wheeler. 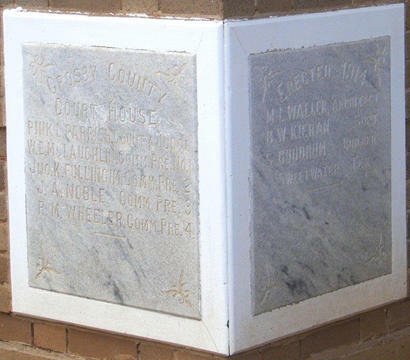 This commemoration is by the 1965 Commissioners Court. County judge, Cecil Berry; Commissioners: Leilan Caddell, Curt Hendrick, Jack Henry, W. C. Odom. 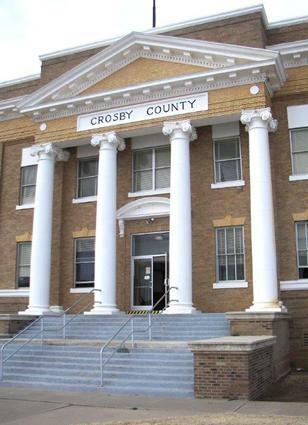 Two years after Crosby County voters chose the new town of Crosbyton as their county seat in 1910, the courts finally resolved the subsequent election disputes, and the Crosby County commissioners set about the business of constructing a new courthouse. 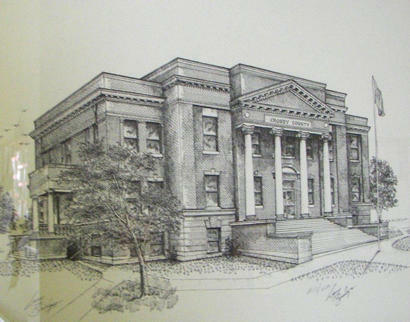 Fort Worth architect M. L. Waller designed this building in the Neo-Classical style, featuring a full-height entry with triangular pediment supported by columns. 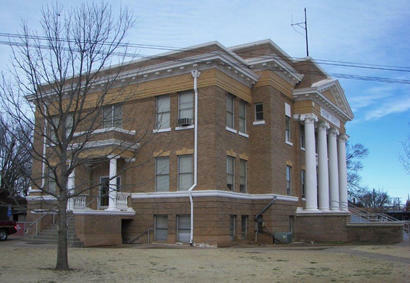 Contractor S. Goodrum of Sweetwater completed the courthouse in late 1914, and it has served as the center of politics and government in Crosby County since that time. 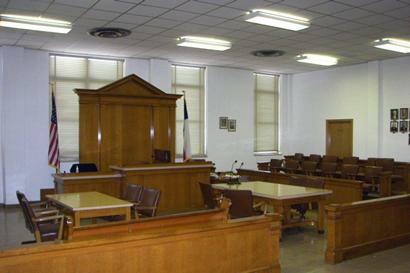 The SE corner of the courthouse. 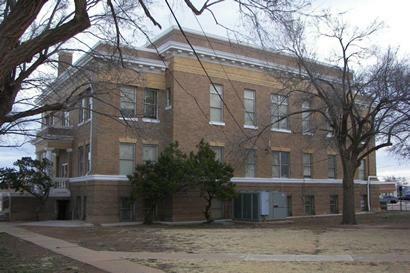 The jail was located in the SE corner of the basement until 1934.